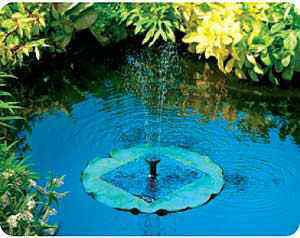 Our solar fountains are ideal for every garden irrespective of size or style. Our range of free floating and submersible pumps come complete with a solar panel either integrated into the product or free standing for remote location. Our pumps produce varying fountain heights, which range from 20 cm up to 2.5 meters. We offer a choice of fountain heads to provide a variety of spray options.